Seeded with a first line taken from a volume in the Penguin Classics series, the wiki invited contributions over a five week period. The result may not have been a novel as we know it, but it certainly produced a community of collaborators who created what John Mackinson, the Chief Executive of Penguin Books, called “not the most read, but possibly the most written novel in history”. The Penguin wikinovel, as it came to be known, touched a nerve in many quarters of the literary world and provoked great excitement in the social media community. The level of reaction in the media and across the web showed that there was a real interest in the project despite the fact that many critics dismissed it as a “PR stunt”, “badly written” or, in the words of Jordan Jack writing in the Yale Herald “the worst book I‘ve ever read”. Linux.com solicited the views of Douglas Rushkoff, and the Internet guru was not optimistic: “A Million Penguins looks like fun, but it’s still likely to remain more a million penguins than a cohesive or coherent bird”, says Rushkoff, who points out that every book needs its author. Other commentators suggested that the wiki was likely to be a failure, albeit a “delightful” one. It was certainly unorthodox. The authors who came together were not the usual writerly stereotypes scribbling away alone in attics, but an intriguing mix of “gardeners” intent on nurturing the novel; “vandals” determined to ruin it, and “performers” hoping to make it showcase for their talents. What they created together turned out to be quite unique. 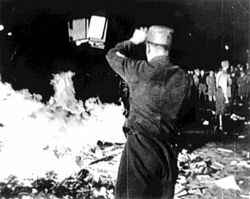 Later Ettinghausen would blog: “as the project evolved I think I stopped thinking about it as a literary experiment and started thinking about it more as a social experiment”. Em Fevereiro de 2007, a Penguin Books e a De Montfort University (Leicester, Reino Unido) lançaram A Million Penguins , um romance colectivo aberto a todos os que quisessem ajudá-lo a escrever. O romance seria criado em MediaWiki, o mesmo software utilizado para a Wikipedia, de acordo com uma ética de colaboração semelhante à utilizada pela famosa enciclopédia on line mas com a novidade de introduzir um elemento de risco e experimentação no âmago da indústria editorial. “Será que uma comunidade de autores pode criar um romance?” questionou Jeremy Ettinghausen, o Editor para o Digital da Penguin, “Vamos descobrir!”. Com o ponto de partida dado por uma citação retirada de um dos volumes de clássicos da Penguin, a wiki foi aberta a contribuições durante um período de 5 semanas. O resultado poderá não se assemelhar a um romance tal como os conhecemos, mas produziu certamente uma comunidade de colaboradores que criou o que John Mackinson, o Chief Executive da Penguin Books, chamou “não o romance mais lido, mas o romance mais escrito de toda a História”. O romance-wiki da Penguin, como acabou por ficar conhecido, abalou muitos dos quadrantes do mundo literário e provocou um grande entusiasmo na comunidade dos ‘social media’. 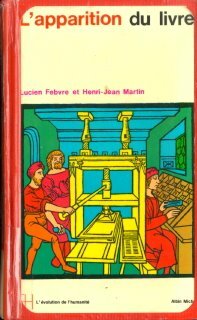 As repercussões nos media e através da web provaram que havia um interesse genuíno pelo projecto, apesar de muitos críticos reduzirem todo o projecto a uma “manobra de Relações Públicas”, “má literatura” ou ainda, nas palavras de Jordan Jack no Yale Herald: “o pior livro que alguma vez li”. Linux.com pediu a opinião de Douglas Rushkoff e o guru da Internet não foi nada optimista: “A Million Penguins é muito divertido mas muito provavelmente continuará a ser um grande grupo de aves sem nunca se chegar a transformar num animal uno e único”, disse Rushkoff chamando a atenção para o facto de todos os livros precisarem de um autor. Outros comentadores sugeriram que a wiki estava destinada ao fracasso, embora um esplendoroso fracasso. Foi certamente uma iniciativa muito pouco ortodoxa. Os autores que congregou não representavam o arquétipo do escritor isolado no seu sótão, mas formavam antes um grupo de “jardineiros” empenhados em alimentarem o romance; “vândalos” determinados a boicotá-lo; e “exibicionistas” alimentando esperanças de dar a conhecer os seus talentos. O que criaram em conjunto acabou por se transformar em algo de fora de vulgar. Mais tarde, Ettinghausen escreveria no seu blog: “à medida que o projecto evoluía deixei de pensar nele como numa experiência literária e mais como uma experiência social”. Um ano depois, diria que “foi a melhor coisa que fiz… mas não a voltaria a fazer”. 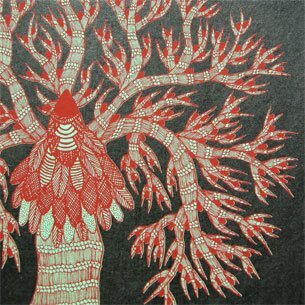 "an alternative vision of what is possible"
“A pioneering project from Tara Publishing, India, is the creation of books made entirely by hand, from the paper to the printing and binding. Content, design and craft: all of these come in to our play with the possibilities of the book. 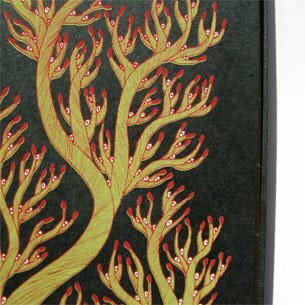 Inspired by older forms, we enjoy transforming the richness of Indian visual arts traditions – through contemporary design and artisanal expertise – into fine bookmaking. 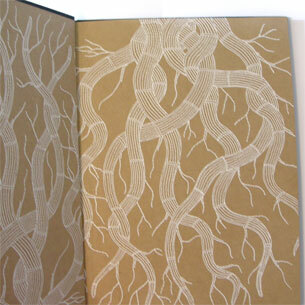 So author, artist and book designer work closely with an organised community of book craftsmen. Whether screen printed by hand on handmade paper, or letter-pressed with tipped in pictures, beaded strings and special boxes, each book is individually made, yet matches the price and quality of a mass produced title. The challenge lies in how many times a book has to be handled, while still maintaining quality and perfect printing. Today our printing unit is a bustling workshop, run on fair trade practices, employing 12 skilled printers and binders. We have so far created a total of 120,000 handmade books worldwide. Our publishing partners range from museums like the Paul Getty Trust in the US, to design houses like Corraini in Italy. Since each page of every book we have ever made is an original print – screen-printed individually this works out to about 6,000,000 impressions in the service of handcrafting the book experience.